Celebrated as one of the most popular tourist destinations hosting millions of visitors from across the globe every year, Bali is the quintessential getaway with its dramatic panoramas, spectacular foothills and immaculate coastal outlooks. Throw in some world-class Bali golf courses for the sport’s enthusiasts and you’ve created the perfect backdrop for a dream vacation. With five first-rate golf courses flanking this magnificent city, your Bali golf holiday is sure to be unforgettable. You’ll find yourself indulging in breathtaking scenery as you practice your back-swing across plush green courses. If you’re an avid golfer with an eye for travel, then Bali’s paradise-like landscape is just the right destination for you thanks to a myriad of championship golf courses and tourist-friendly activities. Relish attractive lakes, pristine sand beaches, beautiful rice fields and imposing mountains as you immerse yourself in one of the most unique golf experiences in the world. As a desirable golfing destination worldwide, Bali hosts five first-rate championship courses. 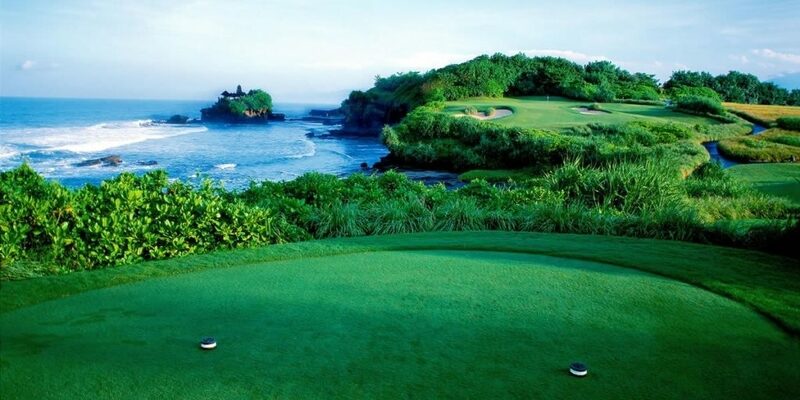 Check out this fantastic Bali golf course list brought to you by Golfasian. 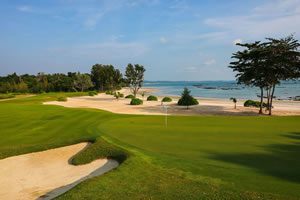 Bali Beach Golf Course: Founded in 1972, Bali Beach Golf Course has been upgraded over the years and is now one of the most popular golf courses in the region. This 9-hole golf course is set amidst tall trees, meandering lakes, green grass carpeting and sandy mounds, offering an challenging experience to all types of golfers. The green putting surface is fairly even without any austere undulations, providing enough room for accurate shots. Positioned just 5 km from Denpasar City, this golf course is ideal for those who want to combine their Bali escape with a few exciting golf rounds. Bali Handara Golf & Country Club Resort: Admired as one of the most astonishing Bali golf courses, Bali Handara Golf & Country Club Resort is sequestered in the Bedugul mountain highlands amidst an extinct volcanic crater with dense forestry and tranquil lake views. If you’re a keen golfer with an affection for nature, then this 1142-meter above-sea-level golf club is perfect for you. Designed in 1974 by Australians Michael Wolveridge and Peter Thompson, this 18-hole golf course offers a pleasant golfing experience with irresistible views of the tropical forest. Bali National Golf Club: Nestled on the southern tip of the island just 15 minutes away from Bali International Airport, the Bali National Golf Club is one of the golfing gems that put Bali on the global golfing map. Selected by Fortune Magazine in 1997 as one of Asia’s 5 best courses for golf, this 18-hole Hawaiian-style course features Paspalum turf with elevated greens and scalloped bunkering. Every hole on this golf course benefits from spectacular ocean views, while stonewalls have been included in the design to enclose the tee boxes and fairways –– characteristic of the rice-field Balinese countryside. New Kuta Golf Course: Situated at Dreamland Beach in the Pecatu compound on the southern shore of Bali, New Kuta Golf Course has been engraved out of limestone and is beautifully positioned between deep-blue oceanic waters and magnificent white cliffs –– making this one of Asia’s most impressive golf courses. Bequeathed by Links Magazine as the Best New International Course in 2008, this 18-hole golf course is fringed with panoramic sea views. The links-style fairways, natural grass and rippled greens ensure that golfers of all skill levels will be suitably challenged. Nirwana Bali Golf Club: As the brainchild of golfing legend Greg Norman, the Nirwana Bali Golf Club produces the perfect golf landscape. Overseeing the deep-blue Indian Ocean and meandering through rice terraces with tall palm trees, this 18-hole golf course has been voted as the best golf resort in Asia and the best golf course in Indonesia by Asian Golf Monthly and Golf Digest. Offering a challenging environment to all types of golfers with its terraced rice fields and strategic bunkers, this breathtaking golf course is one of the most photographed in the world. 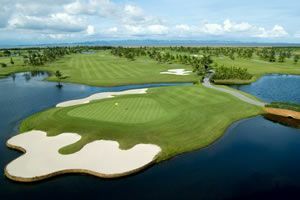 Every Bali golf course offers its own charm with plenty of accommodation and lifestyle offerings to suit many budgets. Benefit from a bevy of Golfasian Bali golf holiday packages as you relish the surreal natural and man-made beauty of the region.